Toshiba. has released home network units which, can receive/send via the internet living information such as new operation modes and controlling the home management. Three models of networked home electric appliances have been launched, a refrigerator, microwave oven, and home laundry. The appliances have built-in self-monitoring capabilities that will notify a repair company if a problem should arise. By means of BluetoothTM, the user is connected via a wireless access point to the Toshiba Web service which controls home electric appliances. The system can propose cooking menus, manage the food in the refrigerator and other tasks by simple operation of home terminal. Furthermore, by using customer's mobile phone the contents in the refrigerator can be checked from the supermarket. A recipe can be sent to the refrigerator and micro oven, and a washing method is sent to the washing machine, thus offering a new operation mode meeting the home requirements. The home terminal (BHT-1002A), coupled with BluetoothTM, serves as an entertainment system which allows the user to enjoy the internet, e-mail, etc. in a wireless environment everywhere in the house. Toshiba is planning to offer a system which wirelessly monitors the door/window opening/closing information, lighting ON/OFF, etc. in the house. Electrolux has developed a fridge with an inbuilt ICL Pentium PC in the door, which consists of a touch screen and bar code scanner. As you load your shopping you scan the codes, and do the same as you take things out again. This enables the onboard computer to keep a running tally of the contents and phone up your local Internet connected supermarket as soon as you get too low on goods. All it needs is a Bluetooth transmitter and the fridge will always be well stocked. Stakeholders and Relationships: Installation of all the following examples in the users premises will require specialist skills. There is no information on how this is or will be done. Most of the working systems are only being marketed in Japan at the moment. Toshiba like many of the large electronics manufacturers are moving more towards being a service supplier, simply because price competition is not so great in this area. It is therefore not surprising that the website the appliances are connected to, is owned and run by Toshiba. However appliances from different manufacturers will have to be compatible if this market is to take off. Bluetooth, which is used by Toshiba, is the most likely standard to be used since it has now been adopted by over 2000 companies. These products are only sold in Japan. 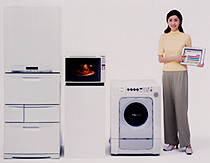 Toshiba manufactures the network system and household appliances. It is not known if it is possible for other manufacturers to plug in to this network with their products. The website is managed by Toshiba. It is not known whether the user has to pay for access to this site. The user has access to both the website and control of the appliances. Toshiba have developed a robot to act as an interface between the user and appliances. Repair companies will be automatically contacted when problems start to arise. It is not clear whether these are chosen by the user or Toshiba. They probable are , since the repairers will need specialist knowledge not just on the appliances, but on the home network. This requires a close relationship between the repair company and Toshiba. Hitachi Home and Life Solutions Insufficient information on system and functions to analyse. Merloni manufacture the washing machines. It probably has a relationship with a mobile phone company for the in built phone. The user is connected to the web by the mains supply. Control is by wireless bluetooth. The user would probably have to pay for the web access and for the inbuilt mobile phone charges. The user requires an account with interconnected supermarket. The supermarkets will have to establish a confirmation delivery date/time with the user. Since a fridge only accounts for a small fraction of the total groceries, it is not clear whether they would want to support this service. Both Toshiba and Hitachi have stated that they intend to use home-networked appliances as a means to shift their businesses from a low profit margin manufacturing company to one more based on software/service systems. The competitive advantage will allow them to increase profits. Most companies seem to be testing the water in selected markets to get feedback on what services under this technology with generate good profits. Product life could be increased by those systems that monitor appliances for problems. Toshiba for instance have increased their warrantee from 1 to 5 years on their networked appliances because of this. Overall the environmental impact is likely to be worse with these systems, because of the increased hardware requirements. Extras include central gateways, tablets for user interface etc. In addition they will require extra energy to use both in mains electricity, and batteries. The Electrolux example will increase transport costs if orders are made just based on fridge contents. The majority of users for all these systems will be women. Research has shown that women are more likely to want simple to use products that they can learn to use quickly, and that bring definite advantages to them, unlike men that are often attracted by technology for technology's sake. The major question is whether home-networked appliances will be simple enough and have enough benefits to gain acceptance by the majority of women. Toshiba have recognised this specifically targeting their needs, and even the brand name 'Feminity' shows the importance put on it. It is probably this uncertainty of the acceptability of this product service that has limited it to a test market in Japan. Reluctance by the main users (women) to embrace home-networking appliances.